CHINATOWN — When Howard Chun returned home from the Vietnam War, he was greeted with slurs and anger that had been boiling for years. Americans who were against the war took their aggression out on the soldiers who, by choice or by conscription, served abroad. "Vietnam Vets coming back were not well received," Chun, of Rogers Park, said. "They ignored us when I came back. When we came back, they spit on us and called us baby killers." But Chun, 77, who served in the Army Corps of Engineers from 1959 to 1990, said he feels no animosity about the cold reception he experienced upon his return. On the contrary, he proudly talks about the war – and the service of his son, who is currently in the Army. On Saturday, he reminisced about his service while sitting for a portrait by Evanston photographer Tim O’Connell at the Chinese-American Museum of Chicago. 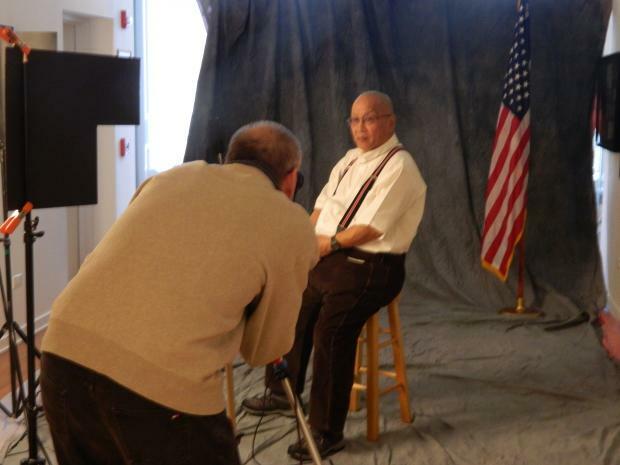 O’Connell, a museum volunteer, invited Chinese-American veterans to have their photographs taken as a way to commemorate their service. "I just though this was a little something to build on. I thought it was a little way to honor the vets and it's a creative outlet for me," said O'Connell, who tried to spearhead a similar project in 2007. "This is more my thing and more rewarding. Hopefully, we can have a big section eventually." To increase interest, he contacted a number of Asian-American military and law enforcement organizations across the state, and hopes to raise awareness of veterans’ tales of service and survival, sometimes in the face of nasty anti-Asian bigotry. Scholars and researchers can trace the history of Chinese-American soldiers as far back as the Civil War. Nearly a century of discrimination and racism would follow, culminating with the the Chinese Exclusion Act and other associated laws that excluded Chinese migrants from working in America or even marrying American women. Still, Chinese-Americans enlisted in World War II in droves and the Exclusion Act was dropped in 1943. It's called a "neglected history" by the museum, even as more than 20,000 Chinese-Americans fought in the war. Chun joked his wife made him attend Saturday’s photo shoot, but said he felt it was his duty to the museum. "I'm not a history buff so it doesn't strike me as interesting, but this is the Chinese Museum," he said. "We don't really blow our own horn. So they archive it because we don't really have our own archive." Another Vietnam veteran, suburban resident Paul Roy, 64, said the photo shoot brought back memories of why he volunteered for the National Guard. “I got involved because my dad, he said, ‘You’re going to serve, so you might as well be an officer,’” he recalled. O'Connell, a former commercial photographer, always thought the veterans deserved more "than a small wall" at the museum. He struggled to publicize his initial effort six years ago. He said it was difficult to get people to come out because "some of these veterans don't wear it on their sleeves." O'Connell, 59, was in high school when some of the veterans came back. While he likes listening to their stories, he understands why they put their military history in the past when they get back. "When these guys were coming back they weren't treated like heroes. Now they're greeted by much more like heroes than the Vietnam War [veterans]," said O'Connell. "People were very vocal about not liking the Vietnam War. They're not out carrying signs anymore." O'Connell said he remembered Chun from the photo shoot in 2007, and considers him "a lifer" in terms of military service, even though Chun keeps his military life under wraps. "He's just an ordinary citizen living in Rogers Park with no Army stories, so you would never guess it," O'Connell said. But after the first set of photos, Chun grabbed his jacket and began escorting a friend who accompanied him over wires and cords. O'Connell caught a glimpse of Chun’s gray jacket with "Army" written in bold black letters on the left side. He asked him to pose with the jacket on. "I thought you were just doing head shots," Chun said to O'Connell. "I want the whole story," O'Connell replied. "You're a perfectionist," said Chun, posing with his hands in his pockets.